When I walked out of my school gates for the last time, I resolved to forget about school and everything that had happened in it. In a couple of months I would turn eighteen. If my grades were good enough (and they were) I would go to university. The future looked rosy; no need to dwell on the past. In today’s language, I could at last move on. I didn’t think, then, about how the past had changed who I was. Although, in the years that followed, I had reasons to reflect on that fact, I continued trying to push the past away. It was only after about thirty years that I began to face my past again. 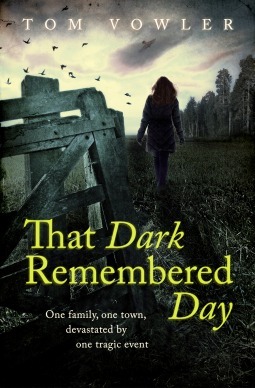 And my past was nothing like as dark and tragic as that of Stephen in the novel I just finished reading: That Dark Remembered Day by Tom Vowler. Stephen has also tried to put the events of that one day out of his mind and pretend it never happened. Then, two things happen to cause him to go back and remember that time, that day. And the assumption, although we don’t see it, is that he will be a better person for having done that. I have no reason to doubt that, although in my case I’m not sure how much difference it has made. This is a novel that will remain with me for a long time. I liked being kept in the dark about the true nature of the event. As the end approached, I was keen to know what happened all those years ago, but nevertheless had to put the book down between chapters, because the story leading up to the event was so dark and difficult to read. The event, when it finally came, wasn’t what I expected. I thought… no, I can’t even say that without giving too much away. You’ll just have to read the novel. The next novel I read will be light and humorous! PS I won this novel on the blog of Jen Campbell, whose latest book, The Bookshop Book, was released recently. You’re right, l just have to read this novel after your recommendation!